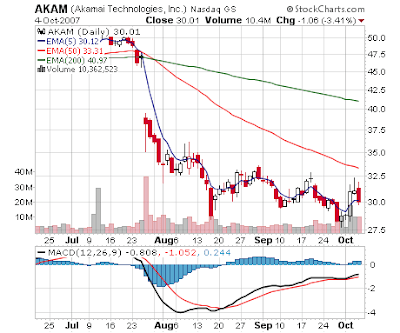 Gosh it is tough to see this former high flier, Akamai Technologies (AKAM) take these hits. I mentioned I sold off the fund's stake in this stock 80% in late August on the threat by Level 3 Communications (LVLT) and then I closed out the last 20% on September 11. "Telecom giant Level 3 Communications is looking to boost its position in the content delivery network (CDN) industry by undercutting competitors. Level 3 plans to sell CDN services at the same rates it sells plain-vanilla Internet bandwidth." "If that claim holds up, it could spell trouble for competitors like Akamai (AKAM) and Limelight (LLNW), which market themselves as premium services and charge premium prices. Because Level 3 already operates a massive international telecom network, its CDN services ride on its own pipes, meaning it doesn't have to buy bandwidth from another telco the way other CDNs do." Back in August I wrote: "If this was 1 isolated event, that would be one thing but there seems to be a lot of issues in regards to pricing as highlighted in this blog for the past few weeks, and each price reduction is lost revenue. One could argue, why take such a strong action in the stock on a future event and one that is not even a guaranteed outcome? My answer is, with so many solid plays out there, with far fewer questions than the CDN space, why bother with large positions in a sector with storm clouds above? Competition is great the consumer of said products - not so great for the investor though." Yes there will be bounces here and there in the stock of Akamai but the chart is technically corrupt, and do you have a good feel where the business and pricing will be in 6 months? 12 months? 18 months? Who can know. I will be interested to hear their take on their conference call. Akamai was one of the survivors from the dot com bust of the late 90s.... just when the video revolution is upon the internet - they get hit with this environment. Tough. This is why I think there are very very few companies out there you can just buy and "forget" for 5 years. This isnt the 1950s or 60s when you can buy AT&T (T) and will it to your grandkids, unless your talking about the very few behemoths out there like a Procter & Gamble (PG).